My name is Risa Conard. I am the third child in a family with 6 children. I got my first Golden when I was 9. I am now 21 years old and have grown up around dogs and puppies. My mother raises English Springer Spaniels and we children have been involved in raising puppies as long as I can remember. I am now a senior at the University of Kansas. I don't have as much free time now, so my mother has the primary position of taking care of the puppies and answering emails. I do find time to play with the puppies, however! Things I enjoy the most, other than dogs and puppies, are studying foreign languages, traveling abroad, shopping with friends, attending church, babysitting and working for my dad at his law office. Easter Sunday 1996, my mother and I traveled to a spot on I-70 west of Kansas City where we anxiously awaited our rendezvous with Sharon Rosenkoetter of Hillside Goldens. She was returning from a dog show and agreed to meet us as she passed through Kansas City on her way home. Among the dogs she was carrying in her van was the most adorable puppy I had ever seen. We were so excited to receive such an outstanding show quality puppy which became my "Goldie". What precipitated my getting a Golden was my experience in 4-H dog obedience class. When I was 7 or 8 yrs. old, I began dog obedience classes. Our Springers were older and set in their ways and didn't seem to enjoy this "new" experience. A number of people in the class had Golden Retrievers and were very enthusiastic about how well their Golden Retrievers took to obedience training. My mother thought that I might enjoy having a Golden to train. After some investigating, we were able to purchase a puppy we named "Goldie" from a well-known show breeder. My Goldie had several litters of puppies for us. We kept a female from her last litter that I was able to raise from birth. Her name is Risa's Golden Honey, better known as "Honey". She has had several litters of beautiful puppies for us. We now have several new remarkable dogs that are producing beautiful puppies for us. We hope you will contact us for a wonderful addition to your family! Others deserving credit are my mother, who does the major part of the work, and my sisters who help while I am at college. We also have friends who bring their grandchildren over to play with the puppies. We believe that socialization of puppies is extremely important. Our 6 children are now grown up and Risa is getting married on May 31st, 2014. Following her graduation from KU and studying abroad, Risa spent the last few years working at her father's law office. In the fall of 2014, Risa will begin attending Law School at UMKC. 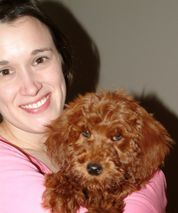 Sadly, her husband is allergic to dogs, so Risa does not have any dogs residing with her. Risa graduated from UMKC law school December 2016. She is presently studying hard for the Kansas and Missouri Bar. My mother, Diana, continues to raise a few litters of English/American as well as English Cremes. If you are looking for a puppy, she would love to hear from you! Unfortunately, Pippi passed away after suffering from a liver ailment all through puppyhood. Pippi had her good days and her bad days, but will be remembered as a very unique and endearing friend. She was definitely a one-of-a-kind.